The EVO1 is the smallest representative of the modular EVO vehicle type, using a single section fully low-floor design that features two fully-pivoting bogies (Bo’Bo’) and an overall length of 15.1m. The low-floor platform was a cornerstone of the new design, with a door access height of 350mm above the top of the rail and internal sections over the bogies at a height of 500mm. Transitions between different floor levels are with gently inclined surfaces, meaning a step-free interior. The twin bogies each use a pair of fixed axles, each driven via a helical gearbox and 65kW asynchronous traction motor, mounted in parallel to the axle; they are also equipped to capture stored braking energy, with independent ventilation. The outer bogie frame and cradle suspension consists of two pairs of helical springs with vertical hydraulic dampers and magnetic track brakes, while 610mm-diameter wheels underwent separate development to ensure reduced noise. Microprocessor-controlled asynchronous traction equipment allows for electrodynamic braking to recover energy back into the power grid. Both the traction motors, including standby electric brakes, are controlled separately; additional electrical equipment allows for multiple-operation coupled sets. The tramcar’s skeleton consists of a welded steel frame with glass-fibre body panels that are glued to the frame and a roof constructed from a sandwich laminate. The overall design is simple and timeless in both the exterior and the interior. In a right-hand driving configuration the tramcar’s side features four sliding doors: one 750mm front door and three 1300mm double doors along the side, providing fast boarding for all passengers. The body strength and impact resistance were validated through simulations carried out by the Institute of Applied Mechanics in Brno, confirmed through crash testing which revealed the expected impact resistance without significant damage to the vehicle. 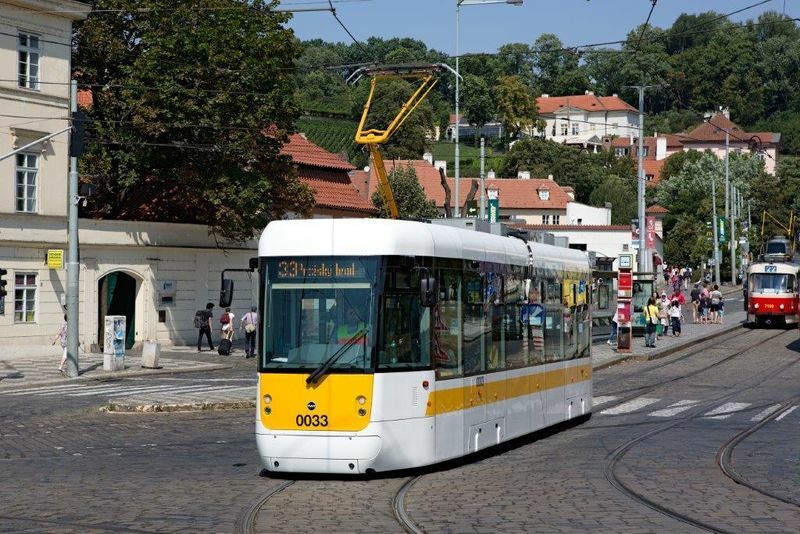 The construction and testing process involved significant co-operation with Prague public transport operator Dopravní podnik hlavního mesta Prahy a.s., whose workshops were used for completion of the prototype, proving our ability to work closely with customers.